When your check engine light pops on, it’s not time to panic yet but it’s definitely time to get some answers. Your vehicle’s engine is trying to tell you something, and it’s a good idea to find out what that is. Precision Auto in Germantown, MD specializes in providing the answers to any check engine light mystery. It may not come with any visible or audible signs of malfunction, which might cause you to think that the issue can be delayed or ignored. Making that assumption could be an expensive mistake. Even if you think you know the problem, there’s no way of knowing what’s actually happening under the hood without our professional diagnosis. Finding out in time what the problem is can be the difference between being on the side of the road and in the fast lane. The truth is, without the right diagnostic equipment, it’s impossible to know the exact reason why your check engine light came on. The number of possibilities are vast, ranging from something insignificant like a loose gas cap to a major transmission repair. Precision Auto’s expert mechanics use state-of-the-art diagnostic equipment that helps us find the specific problem area. Once we discover why your check engine light came on, we let you know how we can make it, and the engine problem, disappear. Every repair service will begin with an accurate diagnosis. Our techs will always steer you in the right direction and find the most effective and affordable repair solution. Sometimes, a check engine light will be blinking instead of being a solid yellow. We still don’t advise panicking, but you should definitely take immediate action. A blinking check engine light means your vehicle is close to serious breakdown, and your next stop should be to Precision Auto. Your safety is our top priority! 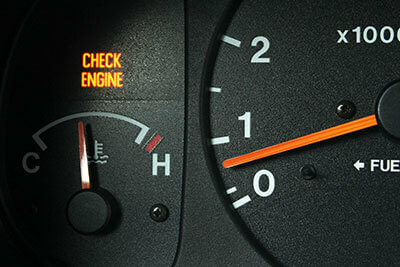 All check engine light repairs begin with an accurate diagnosis from our highly trained and experienced mechanics. You can trust that whatever triggered your check engine light is quickly discovered and quickly fixed when you come to Precision Auto in Germantown. As our name indicates, we perform all our services with exacting standards, leaving no room for error. If your check engine light has recently come on, or has been on for a while, today is the perfect day to schedule a service appointment. Call us at (301) 917-2682 or just stop by. We look forward to providing you and your vehicle with outstanding services.